Villa Islander is a newly completed, beautifully contemporary, four bedroom villa and only steps away from magnificent Grace Bay Beach, Providenciales (Provo), Turks and Caicos Islands, B.W.I.. 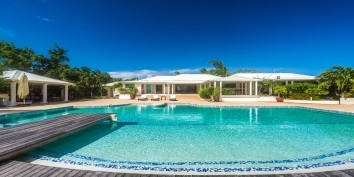 This vacation villa brings a refreshingly new level of tropical chic to the Turks and Caicos luxury villa rentals market. 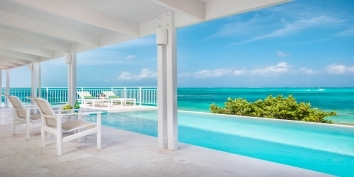 There are a number of beautiful Turks and Caicos villa rentals with late availability for Christmas and/or New Year. There may never be a better chance to spend the Christmas and/or New Year Holidays in the Turks and Caicos Islands. The Villas at Stonehaven, on the beautiful Caribbean island of Tobago, perfectly combine all the privacy of a private villa with the facilities and service of a luxury boutique resort. All of the villas have 3 bedrooms with private bathrooms, but with their flexible rates they can be rented as one, two or three bedroom villas. For a very limited period only you can SAVE up to 20% on your reservation for spring, summer and fall!